Posted on February 26, 2018 by inchan	in Review, Translation and tagged Nogizaka46. It was announced few weeks (or months?) ago that Nogichuu will conduct a fan based vote for Nogizaka46 Best Songs. And this week the songs ranked in 20th to 11th are announced. The votes was held for those who have Google account. One account one vote. And they received around 100K votes. Too bad it’s blurry. Perhaps I’ll get .ts version later just for this. Okay, let’s get to the topic now. Posted on February 24, 2018 by inchan	in Nogi_Satsu, Translation and tagged Akimoto Manatsu, Inoue Sayuri, Iwamoto Renka, Kubo Shiori, Matsumura Sayuri, Nishino Nanase, Nogisatsu, Nogizaka46, Ozono Momoko, Saito Asuka, Saito Yuri, Sakurai Reika, Shinuchi Mai, Shiraishi Mai, Umezawa Minami, Wakatsuki Yumi, Yamashita Mizuki, Yoda Yuki. These photos could be captured because it was members who captured them. Let’s reveal members’ rare true nature here! She is often being entrusted as MC among the 3rd generation members. Her 1st photobook ‘Doko ni Iru no?’ (Koubunsha) is on sale. She is often appearing in some TV shows. Shutter chance for her defenseless sleeping face! Posted on February 21, 2018 by inchan	in Nogi_Satsu, Translation and tagged Nogizaka46. Members’ true nature are made public again this week! Enjoy the photos and the comments from the photographers as well. She’s appearing as Hostess at the stage play of “The Girl Who Leapt through Time”. She also appears often in variety shows. She is way too conscious of the camera that makes herself excessively cunning! Posted on February 21, 2018 by dorimaasan	in Blog Translation, Ikuta Erika and tagged いくちゃん, 生田絵梨花, Ikuchan, Ikuta Erika, Nogizaka46, 乃木坂46. I’ve been using Theater Live 4u recently! Just by watching, you can already consume calories. There was an announcement today. 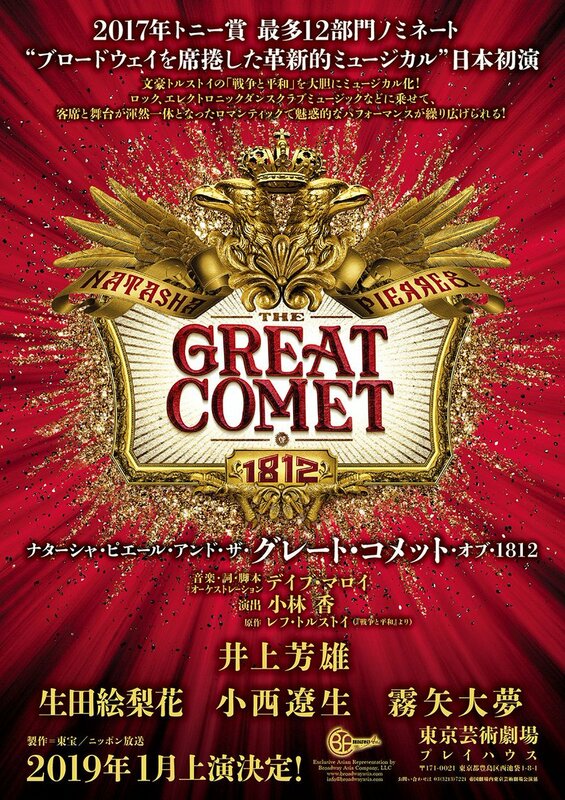 I will take the role of Natasha in“Natasha, Pierre & The Great Comet of 1812″ musical! Inoue Yoshio-san will play the role of Pierre. I wonder how it will be in Japan. This was from our recent Hong Kong live’s dressing room. I will appear in Bananaman-san no Sekkaku Gourmet! Shitara-san has finally recovered from influenza and it was his first recording. Posted on February 20, 2018 by inchan	in Ikuta Erika, News and tagged Featured, Ikuchan, Ikuta Erika, Nogizaka46. It has been announced in Nogizaka46 official site that she will take part in “Natasha, Pierre & The Great Comet 1812” musical. She also stated in her blog that she will play role as Natasha. The musical will be a premiere in Japan and will start to show on January, 2019. “Mozart” is about to get produced and will be shown soon, and now this. It is another amazing opportunity for her to have a leading role in such a well-known musical. She mentioned that she watched “The Greatest Showman” lately. I hope she will take part if the Japanese musical for The Greatest Showman is decided.